From the accounts list, select the one for the exchange rate profit present in the Chart of Accounts. From the accounts list, select the one for the exchange rate loss present in the Chart of Accounts. It is possible to select a second currency in order to view the balances in a currency different from the basic one. 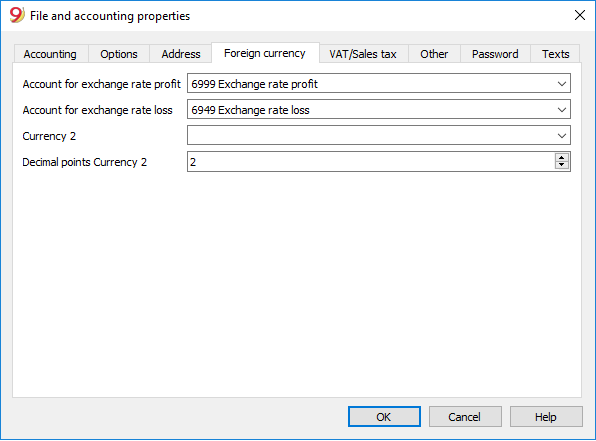 From the File menu -> File and accounting properties... command, in the Currency tab the new currency (that you entered in the Exchange rates table) will be visible, and it can be chosen as Currency2. This is the number of decimal points to be used when rounding the amounts in currency2.